Why early defibrillation is important? The AED is a device about the size of a small laptop computer that analyzes the heart's rhythm for any abnormalities and, if necessary, directs the rescuer to deliver an electric shock to a victim of cardiac arrest. Not all AEDs are the same. In general however they do have common features such as : voice prompts, heart rhythm analysis, and internal memory. An AED must be easy to operate. It uses voice prompts to instruct the rescuer. 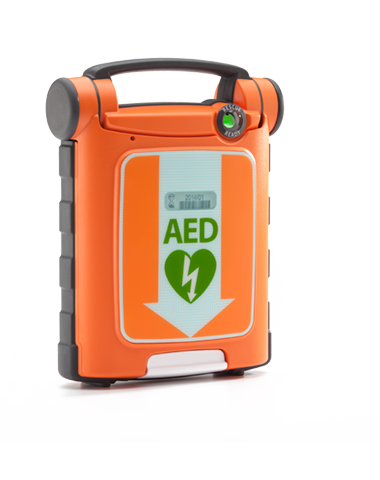 Once the user open the lid of the AED, the unit is turned on automatically. The rescuer will be prompted to apply two pads provided with the AED to the patient's chest. In Hong Kong, there is currently no restriction on the usage, ownership and sales of AEDs. Being a leading international financial centre, with many international conferences held in Hong Kong annually, many overseas visitors do expect similar "heart safe" environment as they are used to in their own Country. AED is the Fire-extinguisher equivalent for medical emergencies. The liability is placed on whether places such as leading Hotels and Convention centres, are equipped with such AED devices, more than the responsibility of a failed resuscitation attempt. Family members of visitors with SCA incidents often ask the question whether AED was deployed during the resuscitation attempts at the place of incident. However, it is also highly recommended that AED users do go through a Certificated First Aid Course consisting of CPR and AED training. This Certificate of "Basic Life Support + AED" allows the user to establish his/her credibility for the rescue of the SCA victim. It goes a long way to safeguard the user in the Court of Law. In fact, all users of AEDs would have an AED Program in placed, which would include certified CPR and AED training. See [Deployment] and [Training] sections.